Can't the item.text be assigned to a String in a Android Studio sample code? It seems that there are some errors with the sample code, I have to replace pasteData = item.text with pasteData = item.text.tostring(). Is the sample code wrong? var pasteData: String = ""
It might be wrong in real world because we can have a lot of types from clipboard. But in this sample, they already note (at number 3): "The following snip tests this, but it only show code for handling plain text". Because it will throw a ClassCastException if the CharSequence isn't a String. It will not compile, because a CharSequence isn't necessarily a String. The method works because a String is a CharSequence. If you want it as a String, you can convert it to one using one of the three options above. Alternatively, if you want to cast it, you could always use is, but that means any other implementations of CharSequence will not do what you expect it to; you wouldn't get the String you need. 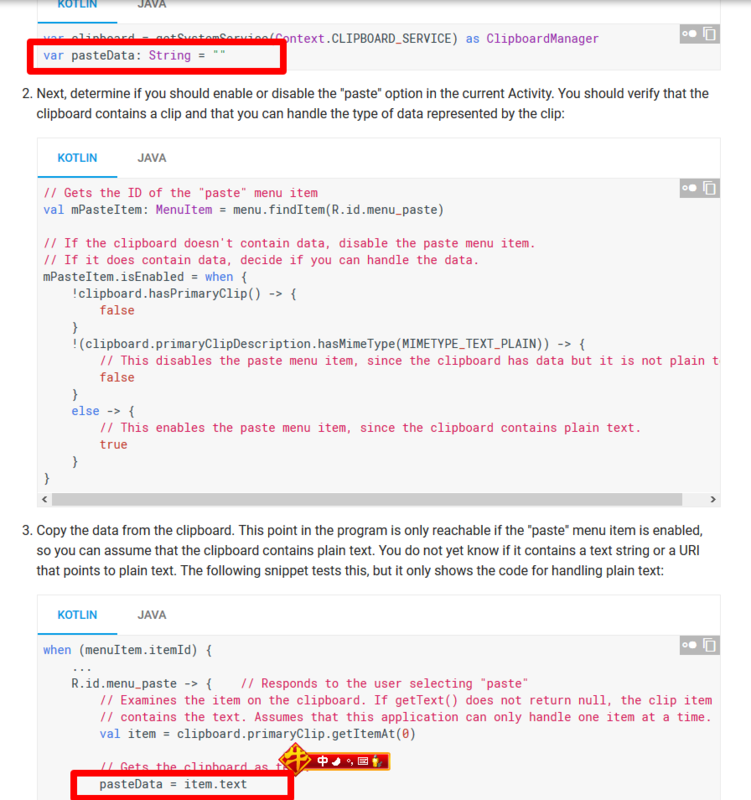 I'm honestly not sure why it uses .text directly in the documentation. Might be a bug, or the API might have changed from String to CharSequence. Either way, you need to convert it. TL;DR: Yes, the docs are wrong.